Blantyre March 15, 2019 —Malawi’s integrated mobile network and ICT services provider TNM Plc, is proud to announce the donation of K8.7 million relief items to Malawi Red Cross Society to assist with relief efforts for victims of floods that hit the country. Speaking during the handover ceremony TNM’s Head of Marketing, Sobhuza Ngwenya said the donation underscores TNM’s commitment to respond to the State of Disaster and ease the pain and suffering of the affected communities. 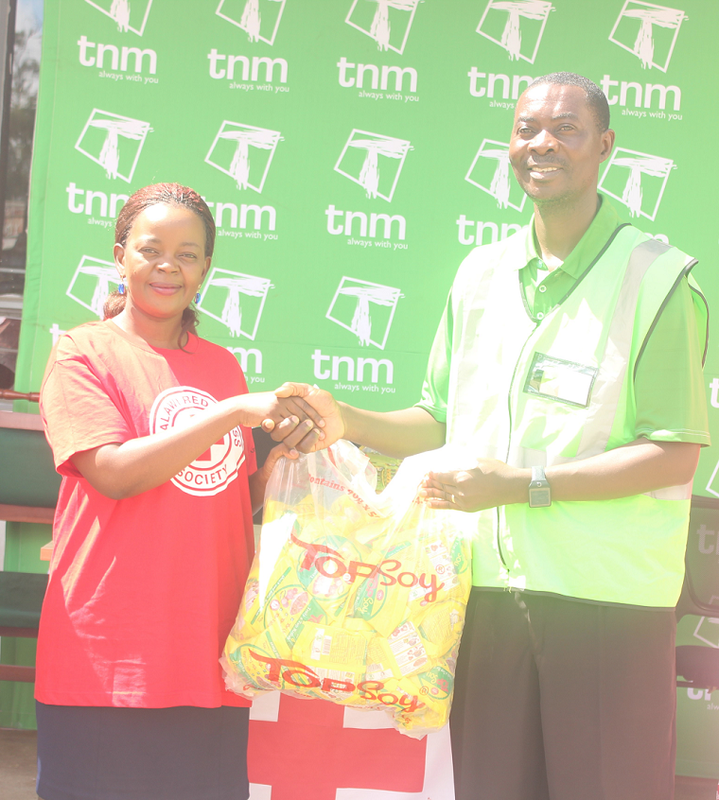 “Following the declaration of State of Disaster in the 14 districts affected by heavy rains and flooding, amidst the likelihood of continued heavy rains as forecast by Weather experts, we at TNM felt obliged to play our part in contributing to the relief efforts,” he said. The relief pack comprises a pack of 20 kg maize flour, 4.5 Kg soya pieces, a bucket, plates, 2 litre cooking oil and 2 kg salt to 500 families (about 2,000 people). The telecom provider has also donated airtime to Malawi Red Cross Society staff to ease communication during the disaster response efforts. The food items shall be distributed to flood victims in 3 districts of Nsanje, Chikwawa and Phalombe. Ngwenya said TNM decided to channel the funds through Red Cross because of the charity’s vast experience in managing resources meant for disasters including the previous working relationship that TNM has from previous relief activities. “TNM decided to channel the funds through Malawi Red Cross Society as they are working directly on the ground where the impact is. The Red Cross is one of the world’s largest humanitarian organisations, and TNM Plc is confident that our contribution will be put to good use as has been the case in the recent past when we worked with them to respond to similar disasters before,” he added. The Marketing Head also expressed TNM’s heartfelt condolences to families who had lost their loved one in the recent disasters, and wished those injured quick recovery and those displaced a quick rehabilitation. “TNM as a Malawian company is greatly touched by the disaster and the plight of the victims. We mourn with the bereaved families and pledge to continue collaborating with agencies like Malawi Red Cross in our response,” he said. Malawi Red Cross Society Director of Programmes and Development, Prisca Chisala expressed gratitude to TNM for the kind gesture. “Let me thank TNM for the timely donation towards the flood victims in the country this will go a long way. Since 2015 TNM has always been with us in times of our great needs. In addition, the company has given us airtime which will ease communication with our staff and volunteers working in different districts,” said Chisala. Chisala called on other institutions to emulate what TNM has done because the needs of the victims are numerous. According to the Department of Disaster Management Affairs (DODMA) in the Ministry of Homeland Security, the death toll from the floods reached 56 this week but assessments were still going on as Malawi also braced up for more heavy rains and wind from Mozambique brought by Cyclone Idai.